The camera you can focus with your eye? What fresh madness is this! Canon’s EOS range is one of those rare things: a range of film cameras that – apparently – effortlessly bridged the gap between analogue and digital. More than 30 years after its introduction, the EOS range lives on, praised by stills photographers and videographers, and with a range of models for everyone from hesitant amateurs to hardened pros. Canon cottoned on early that their new autofocus mount could live on a range of cameras, each of them a step up from the last. Like Nikon, they introduced intermediate models aimed at the ‘prosumer’ – enthusiastic amateurs looking for more features but not the savings account-emptying price tags of the pro models. Their prosumer models spotted tougher plastic casings, more sophisticated metering, advanced autofocus and a better range of flash modes. Even better, the pro-sumer models were almost identical in layout to the cheaper EOS models. You could step up to a new model as your skills advanced without having to relearn all the controls. The camera’s flash broke with the tradition of previous EOS models, which had sensed the amount of light falling onto the film plane during the exposure. Instead, the E-TTL system would fire out a low-intensity flash just before exposure and meter off the light reflected back. There was another trick up the EOS 50E’s sleeve, too. As well as selectable auto-focus points tough – useful if, say, you wanted to focus on a face in an offset portrait tough – the camera had one very special feature that even 20+ years later seems like something out of Buck Rogers. Yes, look at any of the EOS 50E’s three different focus points – marked prominently in the viewfinder – and the camera detected it. Hey presto: the camera moves focusing without a finger being involved. It’s not often that a film camera featured something that has not yet made it to digital models, but Canon produced a range of film SLRs, starting with the EOS 5 in 1992, that sported this function. (Read this informative piece on DPReview for more detail.) Canon’s high-end digital SLRs feature some focus-friendly aids as face-detection and eye-detection which put this focus-finding technology inside the camera rather than having to rely on your eyes for cues. 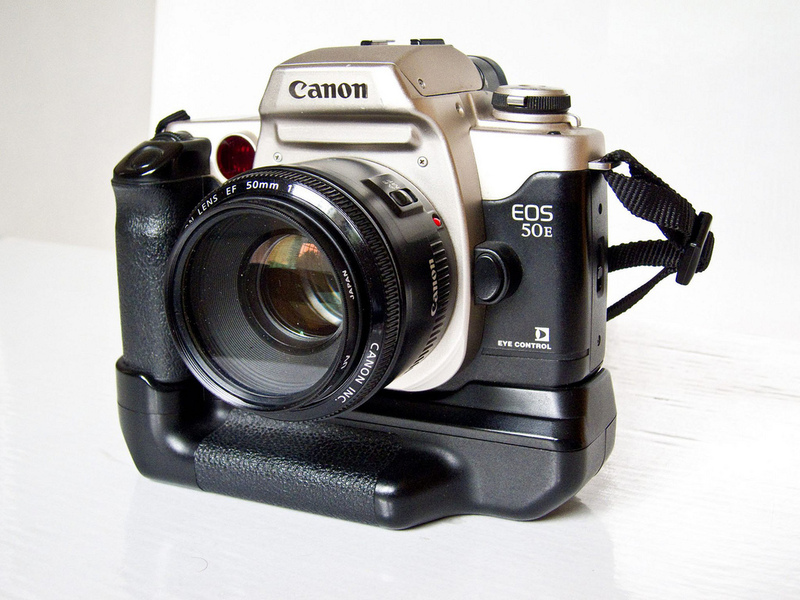 This being the 1990s and not the 70s, most of the EOS 50E’s body was plastic, apart from the lens mount, and the top plate, which was protected with an aluminium cover, Compared to the lighter models in the EOS range, the 50E certainly feels heftier. Extra weight means extra protection, right? EOS 50Es usually shipped body only or with all-plastic zoom 28-80mm zoom lenses from the cheaper end of Canon’s stable; perfectly capable of taking decent pictures, but not particularly tough and not particularly fast. Ditch the zooms, however, and you could spend money on glass without breaking the bank on a body. And if you wanted to bring a bit more pro-level firepower, there was an optional battery grip that made shooting portraits easier, and made the camera look a little more like something you might find hanging off a paparazzi’s shoulder. 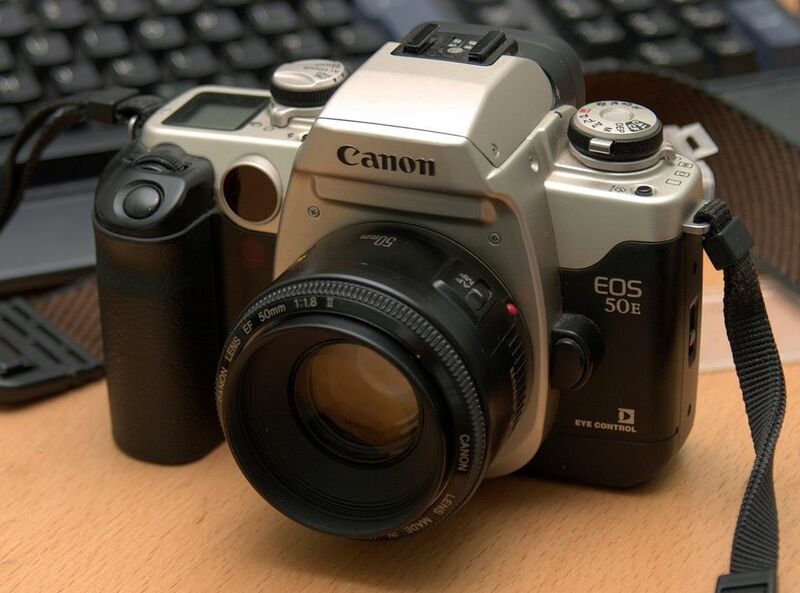 The EOS 50E remained in production until 2000, when it was replaced with another prosumer model, the EOS 30. It certainly contributed to the success of the prosumer experiment in Canon’s SLR range, something the EOS marque has continued in the digital age with models like the EOS 7D and 10D. In the wake of digital takeover, and the almost complete death of the film SLR in the last decade, many people choosing to shoot film have concentrated on metal-heavy, manual focus cameras from the 60s and 70s, rather than the plastic-bodied autofocus SLRS of the 90s and 2000s. The reasoning is that the less electronics and liquid crystal displays, the easier these cameras will be to repair and find spare parts for. Not bad logic, but the EOS 50E was a lot of camera for the price you’ll pay for it now (a trawl through recent prices paid on eBay show they can be had in working order for as little as £12). I owned an EOS 50E from around 1999 until the mid-2000s, when I traded it in for a Nikon FM2. It went with me on trips to the US, Cuba and New Zealand, and a few European weekend city breaks. In all that time, the most I had to do to it was replace the battery. 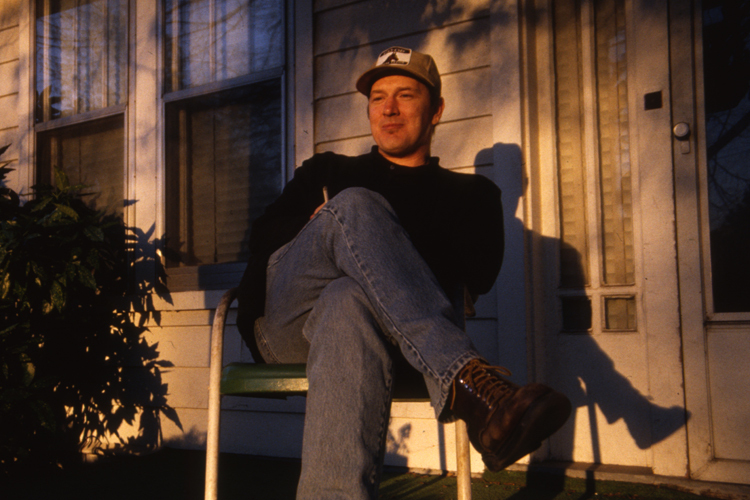 By the mid-90s, the autofocus SLRS from the likes of Canon and Nikon were incredibly reliable. The gremlins that had plagued the first generation had been well-and-truly tamed. Previous articleNuBox 1: What’s in the box? I have a Canon EOS A2e with this eye-focus system, and my review of it is meh. It sort of works, but it’s really not any better than the camera’s traditional AF. I have an EOS 30 with eye control. I rarely use the eye control feature, but the camera is great to use. I love it, and they are not overly priced on the Bay either.